Every transaction is included in GST returns, regardless of whether it’s been reconciled or not, which means that sometimes a transaction might sneak into a GST return when it really shouldn’t. This is an accidental double up of transactions and can occur when transactions have been entered in two different ways. For example, you may have manually entered a transaction from an invoice and also automatically imported the transaction from the bank feed, giving a double up of a transaction. You can delete these types of transactions before they are locked into a finalised GST return. However, if they are included in a GST return you will need to create a reversal transaction to 'remove' it. The reason for this is any changes to the original transaction will invalidate the GST return and it will no longer match what was filed with IRD. In the Transaction screen you can use the Filter button to find these transactions. They will generally be unreconciled, so tick the Unreconciled button to display these transactions. Note down the transaction date, amount(s), other party, and coding of the transaction. You will use these details to create the reversal transaction. TIP: Make sure to note whether it is an expense or income transaction, as the reversal will need to be the opposite. To create a reversal transaction you will need to create the opposite to the original transaction e.g. if it was an income transaction your reversal would be an expense transaction and vice versa. Scenario: Dan accidentally records his Countrywide subscription twice in the Transaction screen. They're then included in a finalised GST return. He needs to create a reversal transaction (an income record) to balance out the duplicate transaction (an expense record). 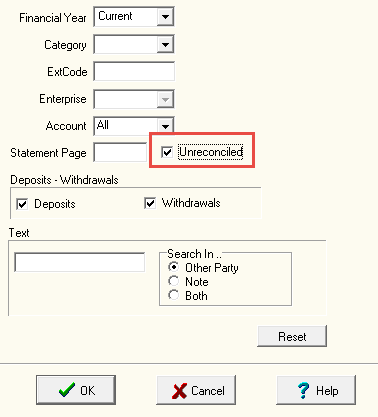 To reverse an expense transaction, click on the Income button at the top of the transaction screen. The Transaction date, Amount and Other Party should be the same as the original transaction. Record the same category and extended code as the original transaction. Record a clear note the explains why the reversal was created. Click Ok to save the reversal transaction. For reversal transactions that are made up of multiple lines have a look at the topic multi-line transaction. Reconcile the original transaction and the reversal. This helps to keep your database tidy and will let you close the current financial year once the new year rolls around. Don’t worry though, because they zero each other out, reconciling them won’t affect your accounts. How will this affect my GST? The reversal transaction will be pulled into your next GST report so that the GST portion can be claimed and correct the incorrect claim in the prior return. The previous GST report remains unaffected by the reversal transaction.